In the beginning of October, Craftsy ran a $10/all you can watch for the month of October promotion. I didn’t get an email about it, and I didn’t see an ad for it, but someone posted about it in the Crafty Gemini Facebook group, and I ran, tripping to jump on that Craftsy train. I’m thinking that it wasn’t very highly publicized because it’s some kind of a test or experiment for a subscription model business plan a la Netflix. And, I would be all over that deal if it was every month. Because Brave Girls – the ultimate Netflix of art/craft videos – no way, Craftsy – hell yeah! So, I strapped in for the month of October, got out my knitting needles – because if you’re going to watch crafting, you might was well do crafting – came up with a game plan, and went to watching. My plan, oddly, was essentially to watch all of the classes I wouldn’t actually pay for. You’d think I’d start with my wish list – but, my wish list are classes that I’d pretty much agree to pay for as stand alones. So rather than start there, I went for things I was interested in, but wouldn’t have thought to take. So, I started with knitting. Never pay for a knitting class? But you’re a knitter, you say, puzzled. But, the things is, as far as techniques go, if I need to learn something to start or finish a project, I’m an experienced enough knitter that I can watch a youtube video, and pretty much figure it out. I certainly don’t need to take any of the beginner knitter classes, or project classes like my first hat or socks or sweaters. So, I narrowed it down to classes that couldn’t be learned on youtube, design classes. For a run down of the knitting classes I took, and what I thought of them, pop back in on Wednesday when I chit chat about knitting. Today, I’m going to focus on the class I took when I had exhausted my knitting options. After knitting, I moved on to sewing. 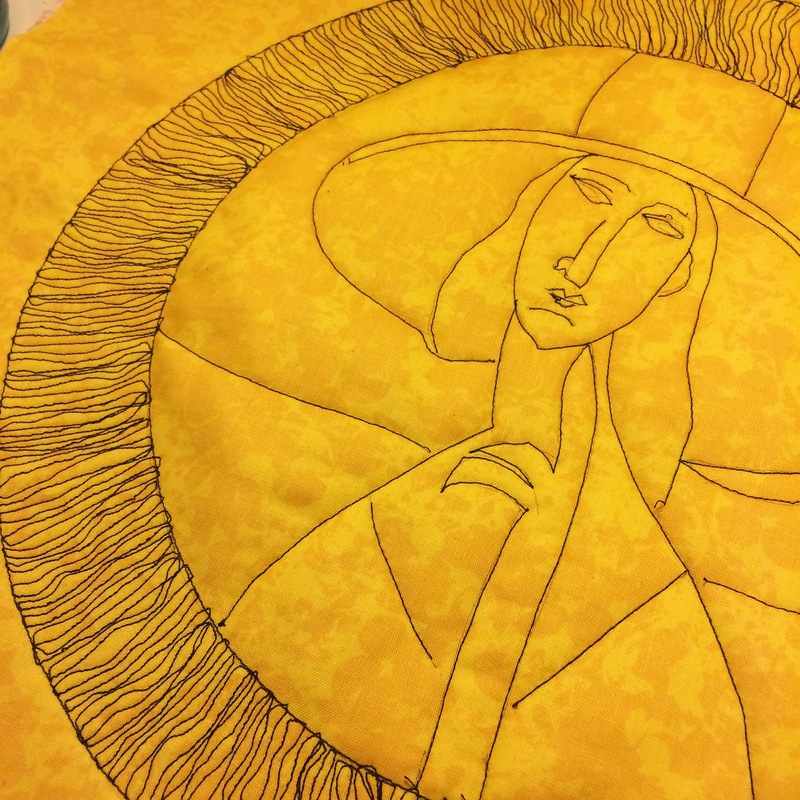 I didn’t start with sewing for two reasons – one, I’m not sure what happens to these classes at the end of the month, and two, when I take sewing or quilting classes, I pretty much do the projects with the instructor and that’s not so good for binge watching. Here’s what I mean about the uncertainty of these classes – Craftsy classes are normal lifetime access. The $10 deal was all you can watch in October. In theory, I could have started the first lesson of every single class on the site, and added them to my library. And, that surely couldn’t have been what they meant with the $10 deal (of course, if i had read the deal all the way through before I clicked on the Buy button, I’d know the answer to this question – I was just too excited!). I’m assuming that whatever I “bought” in October is going to expire at the end of the month. So, for that reason, I’m watching the entire class (unless it’s simply not what I thought it was going to be) all the way through before I start another class. So, watching a project class all the way through to the end, then watching another one, etc., I may not be able to go back and watch them when I’m actually sewing the project. 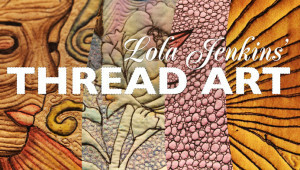 So, again, the first class I clicked on was a class that I wasn’t sure I’d actually end up making a project, something I had an interest in because it’s interesting, and something I probably wouldn’t have even thought to buy – Thread Art with Lola Jenkins. Can I just say this – SO MUCH FUN! First, Lola is a character, and she’s really very encouraging with her repeated emphasis on there being no mistakes. She starts off the class with a brief introduction of herself, in which she shares that after suffering through some of her own health problems, she then lost her husband. To cope, she bought a sewing machine, and taught herself how to make her own brand of thread art. See, here’s the way I like how art and healing can be incorporated in an online medium – her art saved her – she shared that with us, and then taught us her techniques. That’s it. No faux unlicensed therapy, no you are enough, no martyrdom – just get to work, and maybe you’ll feel better like me. Or maybe you’ll just make something you love. Unfortunately, I don’t have any light, semi-solids in my stash. I either have solids, or patterns, not so much with the batiks or the motled solids. 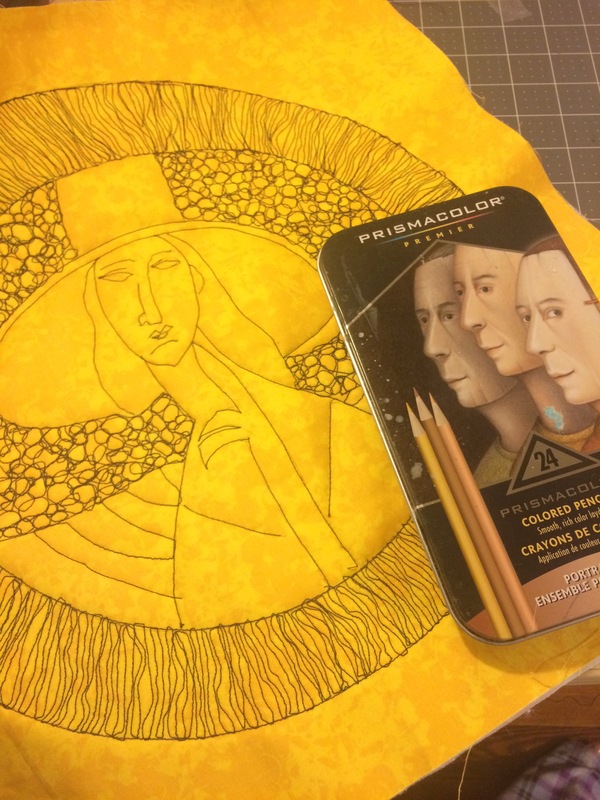 But, I did find this fat quarter in one of my mystery boxes, and while yellow isn’t my favorite color, I think it’s ok for this project. There are some mistakes – oh well, it makes it less Modigliani, and a little more me. That’s ok. After stitching out the girl in the hat, it was time to fill in the background. For the border, I went with one of three background fillers that are discussed in the class, the Lola’s wiggle – basically, hatching with wiggles. Perfect for those of us who don’t sew so straight. Then, for the background, I went with my own version of pebbles – meaning, I did my best, but it’s a little messy. But, I still think it looks ok. Tonight, during the Eagles/Giants game, I’ll move on to the next step – adding colored pencil. 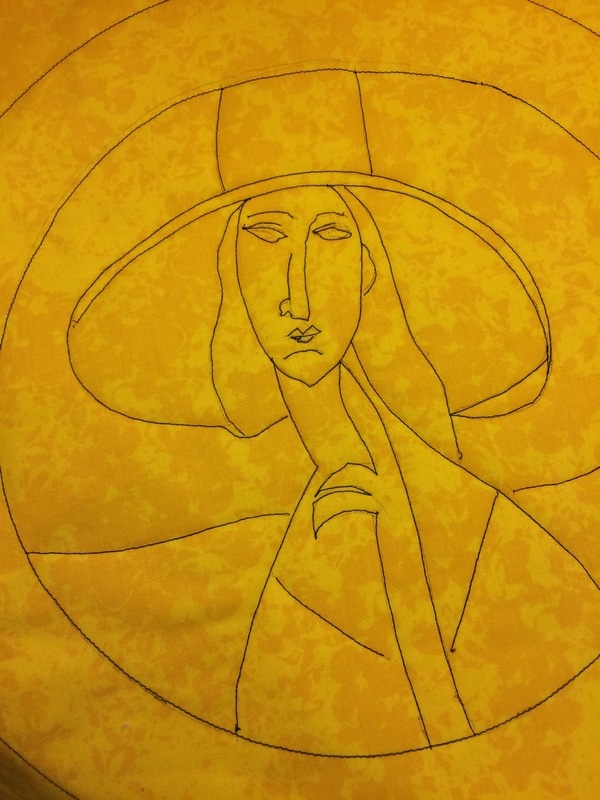 Anyone looking to take this class to learn free motion quilting, you’ll get the flavor of it, but it’s not a full blown class on free motion stitching – she really doesn’t talk about how to set up your machine for free motion work, or how to move your fabric, or how to keep your stitches even, and that’s ok. She’s self-taught, and free motion is one of those things you really learn by practicing. I did binge watch one of Leah Day’s free motion classes – and of course, she’s an excellent source for free motion technique. So, I’m not sure how I would have done with this stitching had I not watched Leah’s class first, but I still think that Lola makes everything look so easy, that anyone could get started. And, as you can see from the number of projects posted on the class platform, a lot of people were inspired to try what was probably a new medium for them. So, I highly recommend this class ! Even if my project doesn’t work out so good in the end, I enjoyed watching Lola create, and I had fun making my own thread art – at least up to this point. We’ll see how coloring and football goes tonight!